Aravindan’s makeover from a cartoonist to a film maker, was a blessing in disguise for Malayalam filmdom. A scene from Utharayanam with Balan K Nair and Premji. KOCHI: G Aravindan is remembered by all, especially the film fraternity, as a film maker. But not many know he was a cartoonist, a composer and a philosopher too. Kerala Kalapeedom, in association with Cochin Film Society, organised a remembrance ceremony last Sunday which turned out a fitting homage to this multi-faceted personality. Aravindan’s makeover from a cartoonist to a film maker, viewed as a great loss by readers, was a blessing in disguise for Malayalam filmdom. In fact his celluloid poems reflect the myriad aesthetic views of this great director. Through his popular cartoon, ‘Cheriya Manushyarum Valiya Lokavum,’ in Mathrubhoomi weekly, Aravindan portrayed relevant themes such as the plight of jobless youngsters in the state through caricatures and crisp remarks. His characters brought out the inner conflicts of the youth, the problems faced by elders and the cause of women, especially during the late sixties, and early seventies in a poignant way. With this thoughtful cartoon Aravindan tried to expose the pseudo realistic approach of an average Malayali towards life. In this black humour, similar to the satirical renderings of a chakyar, Aravindan peeled off the egoistic mask of Malayalis who make false claims of cent percent literacy. Guruji, the silent witness of eroding human values in ‘Cheriya Manushyarum Valiya Lokavum’, indirectly reveals the irrelevance of a luxurious life. Another interesting character is an insurance agent, Ramu who is always seen riding a two-wheeler. 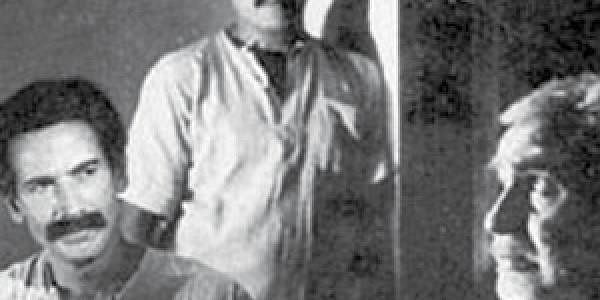 In one of his films, based on a story by Pattathuvila Karunakaran and a firebrand script by Thikkodiyan Aravindan could successfully showcase the frantic state of post- Independence Indian youth. Even after his migration to the silver screen we could see Aravindan’s immortal characters like Ramu and Guruji figuring in his movies, especially in ‘Uthrayanam’. His intentions while crafting a film seemed to be to depict the deep desires of human kind and find an answer to the puzzle of life, said an avid reader who can still recall the waves created by Aravindan’s cartoons. The tranquility of village life and the innocence of villagers inspired him. Once Aravindan trained his camera on the village folk of Thirunavaya, along the banks of Bharathapuzha, who were seeing a circus tent for the first time. The experience was so innate that like the villagers the viewers too were not aware of the presence of his camera. In the film ‘Oridathu’ Aravindan showcases the distorted mind of a village when electricity brings drastic changes. The satirical portrayal of communism in the film went on to evoke an uproar amidst revolutionaries of his days. The director’s keenness in choosing the dialects for different characters is evident in this film. While adopting a Valluvanadan slang for the villagers the director carefully selected a Travancore slang for the fake doctor. When Aravindan worked his directorial skills on the short story by C V Sreeraman, it literally bloomed into a poem on celluloid - thus was born ‘Chidambaram’. He skilfully tapped the acting potential of Bharath Gopi, Smitha Patil and Sreenivasan, to immortalise each and every frame of this striking movie. In all these celluloid charms we can feel a uniform fragrance, that of heavenly music, which Aravindan cherished throughout his life. His bond with music directors like K Raghavan, M B Sreenivasan, Hariprasad Chaurasya, Rajeev Tharanath, M G Radhakrishnan and G Devarajan resulted in many endearing songs, some of them being ‘hrudayathin romancham’ and the popular folk tune ‘karu kara karmukil’. The long musical sessions shared with the director are still cherished by many renowned musicians of his times like the legendary sopanam singer, Njaralathu Rama Poduval. During the remembrance ceremony T Kaladharan of Kerala Kalapeedom started with his memories about the genius. Renowned painter Akkitham Narayanan inaugurated the meet. The special invitee, writer Sethu, shared his views about Aravindan after describing the director’s role in spreading the film society culture in Kerala.